Pinch and a punch for the first of the month – our second morning in Varanasi was the 1st February and saw us up at 6am for a walk along the Ghats. Tuk tuks ferried us to the city centre and the familiar walk amongst the heaving crowds, down to the waters edge. Even this early in the morning the city was buzzing as shop keepers shifted sleeping cows from in front of their stores as they set up for the day. As we neared the waters edge it became apparent that there was a thick mist blanketing the Ganges – blocking out the sun. Whilst not ideal for photos it did give the morning walk an eyrie feel. Fires from the previous nights prayers still smouldered, but the religious ceremonies had given way to the more mundane chores of daily life. The local boat people were striking – meaning no river trips, which provided a much needed opportunity for boat repairs. 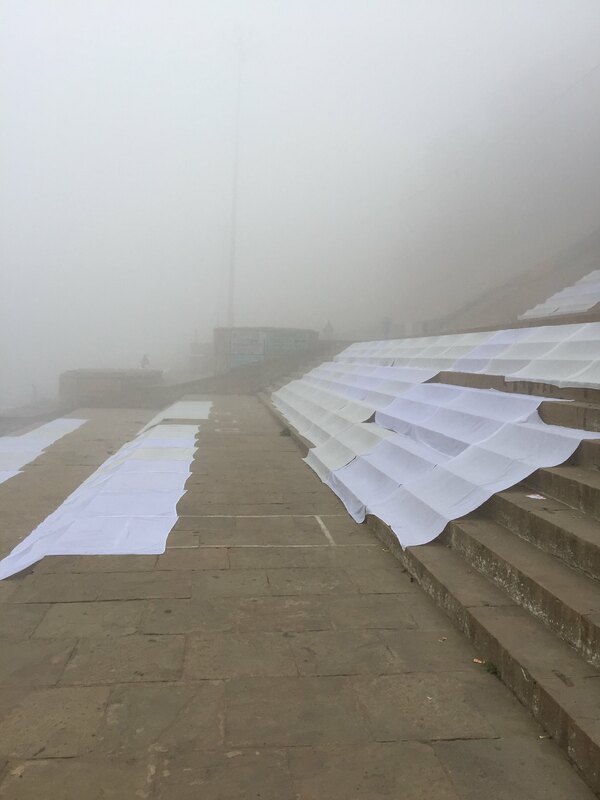 Alongside them white bed linen from nearby hotels was being washed in the river and beaten, before being draped over the Ghats (steps) to dry…this seemed rather optimistic given the damp mist and cold temperature. The process of washing in the worlds most polluted river also explained the questionable stains on our bedding! 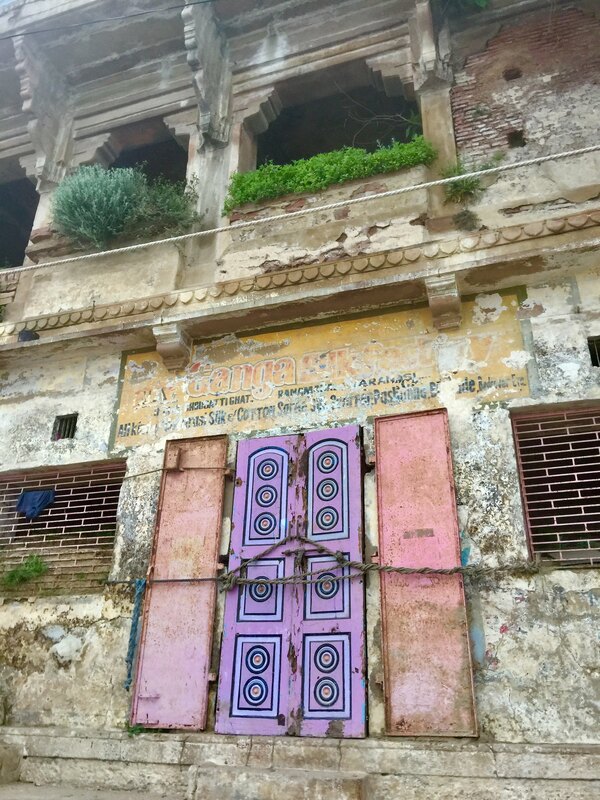 We walked the Ghats until we reached the smouldering funeral pyres – strictly no photos, nor spectating so we headed back to the main road, for breakfast at a bakery. The house speciality was American Pancakes with maple syrup – and oh my word were they good! Diet out the window – we demolished the pancakes and black tea, before catching another ‘auto-rickshaw’ (tuk-tuk) back to the hotel for a morning nap. Refreshed from our 5am alarm call – we headed to the house/ restaurant of a Tibetan family to learn how to make some traditional delicacies. Jamie was first to volunteer to try his hand at making momos – with a little bit of practice he kind of found a technique for a basic momo . Thankfully, our lunch had been pre-prepared, no doubt our attempts were destined for the pet German Shepard named Amy. After lunch the tour split up – most people wanted to go shopping at the silk factory, but having experienced something similar is Cambodia a few years ago, we opted to return to the Ghats for a third time to try and get some photos minus darkness or mist. When we arrived at the water, for the second time that day, the mist had lifted and we got a clear view across the Ganges to the massive flood plains on the opposite side which were now exposed by low tide. We walked along the waters edge, passed kids playing cricket, a man washing his cows, families bathing and a chaotic cremation area where dozens of covered bodies were awaiting a religious send off. We paused only briefly, not wanting to offend any of the attending family (only men allowed as they are less susceptible to having the souls of the dead enter their body during the final rights). We ventured inland, through a seemingly endless maze of back streets that were clearly off the regular tourist trail. It was like a scene out of a fantasy film – historic buildings, intricate architecture and crumbling ruins in every direction. The senses were alerted at every turn, little curio shops, cows sleeping in door ways, scooters flying down cobbled street. After what felt like hours of relatively directionless wandering we conveniently popped back out on the main road, a mile or two from where we thought we actually were but luckily nearer to where we wanted to hail a tuk tuk home. Another adventure ensued with Jamie riding up front, we’d found the only driver in India who used his hooter sparingly but who also shunned the main roads. 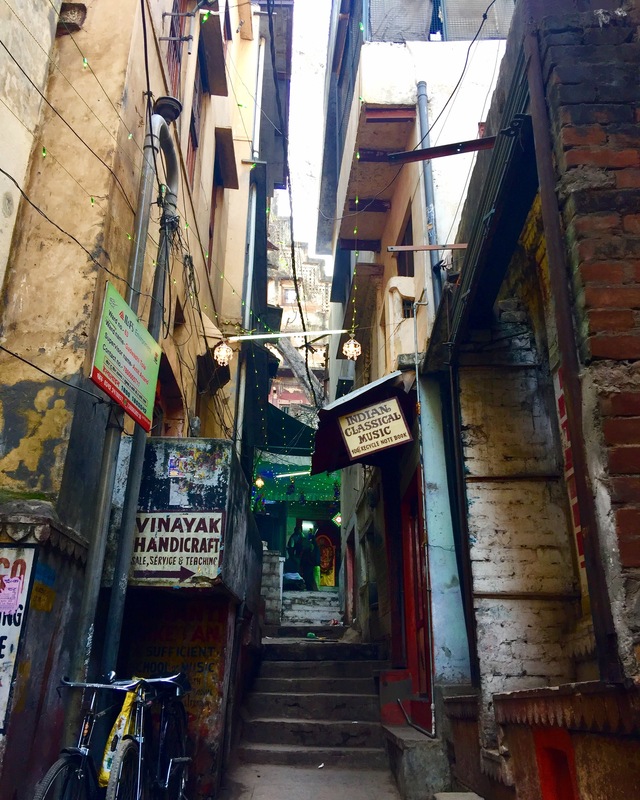 What followed was a rollercoaster 30min ride though hidden streets, dodging cows and oncoming traffic on our way back to our hotel – ahead of dinner and a 4am start for our next train to Lucknow.